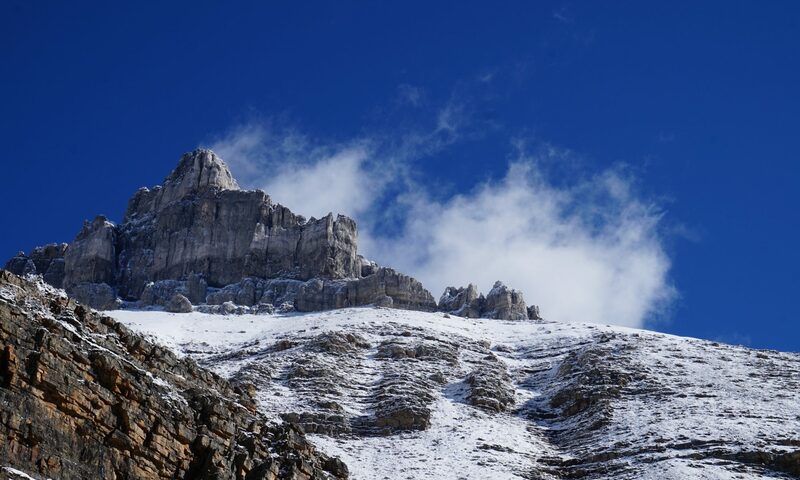 Introducing…a Lambda function written in Python! 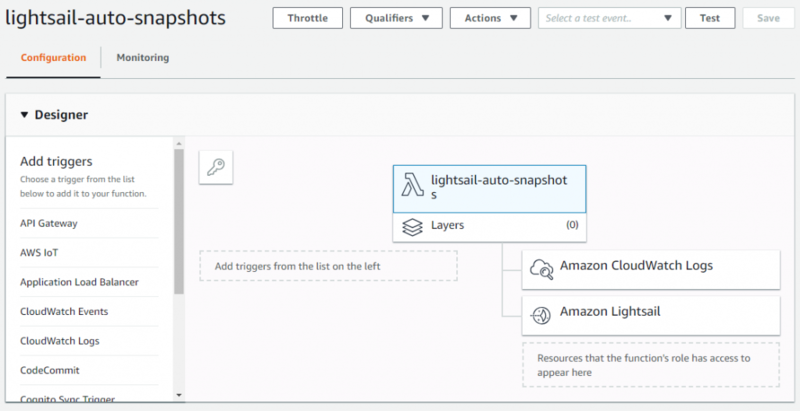 There’s a repo under the Amazon Archives called lightsail-auto-snapshots – I used this as the base for my function (I didn’t try the deployment template as I wanted to create it end to end). Although it’s been archived, it still works and was a good starting point. 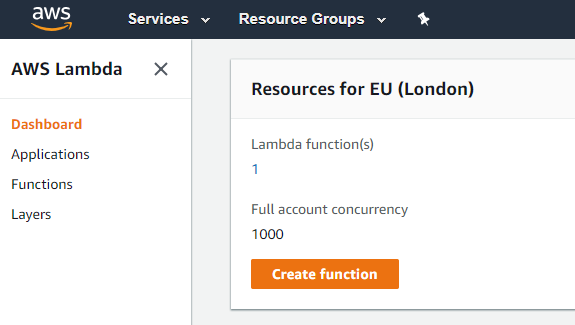 Head over to the Lambda console to create the function. To create, hit the “Create function” button and fill in the basics. We’ll need to create a custom role to determine what the function can access. 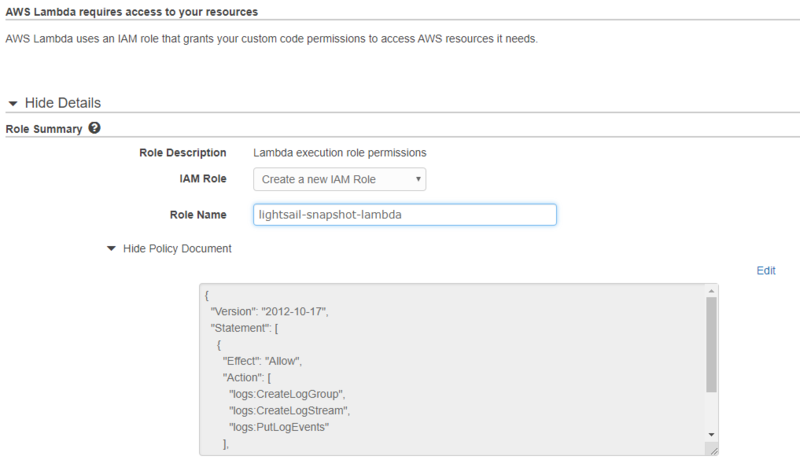 The role will need to be able to put logs to CloudWatch, but I’ll configure the settings in the next step. Once the policy was created, I headed over to IAM to attach a new policy to this role. Alternatively, I could have created one policy for the role by combining this with the default policy above. Now that the function has been created with the right role, we just need to configure the function code and parameters. Ensure the runtime is still set to Python 2.7 and the handler refers to the index file. I only used the retention period via the environmental variables, which is lower to control cost. The last bit of config here is to ensure the role is correct, and that you’ve set a description and timeout. The event rule will trigger our function, and is very straightforward to set up. 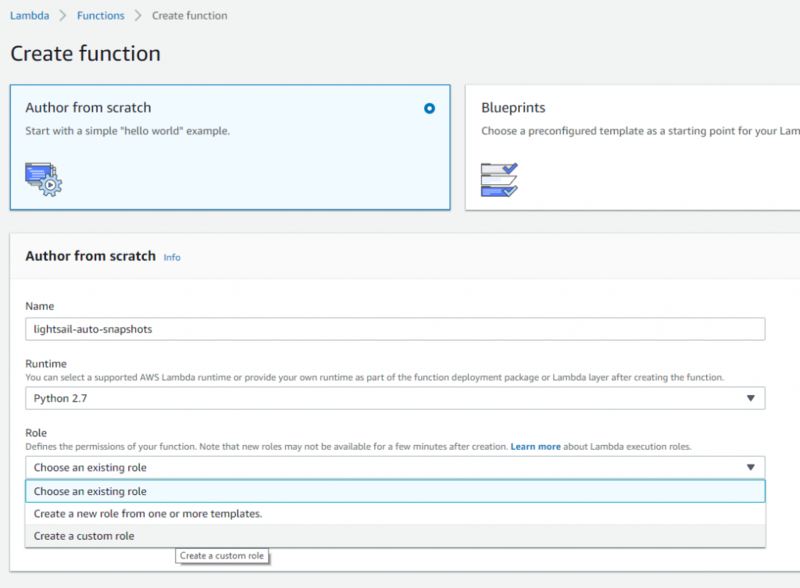 You can create a new rule through the Lambda designer. 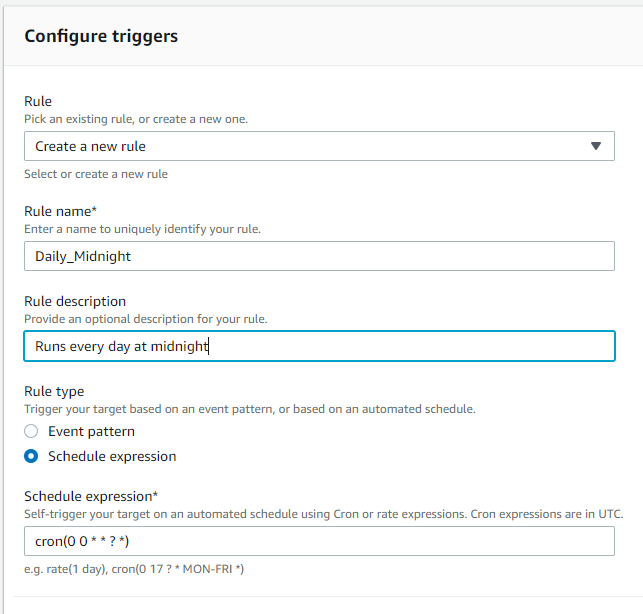 This creates a rule which executes every day at midnight, using a cron expression. 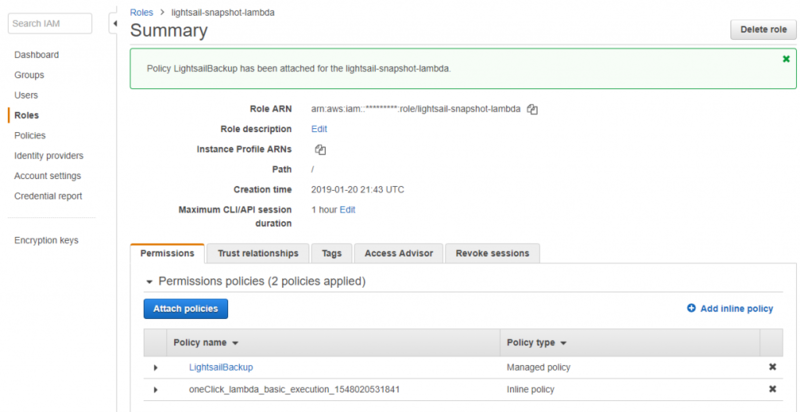 As AWS operates on a pay-per-use system, it’s interesting to note the potential cost for both taking, and storing these snapshots. On the Lambda side, it took ~6 seconds to run for 6 instances in Lightsail (Lightsail will take a few minutes to create these snapshots, but our script doesn’t check for completion). If we assume we’ll run this function up to 31 times a month (i.e. every day), then we’ll consume perhaps (6*31=186) 186 seconds a month. There’s a lot of head room here on the free tier, but even without that it’ll still cost less than $0.01. The storage of the snapshot is a different matter, and is billed as one of the Lightsail services. This part is much less clear due to the way these are billed, and on the way that they are presented in the Lightsail console. Bearing the above in mind, it suggests that you will pay a base rate of $2/month for a 40GB snapshot. 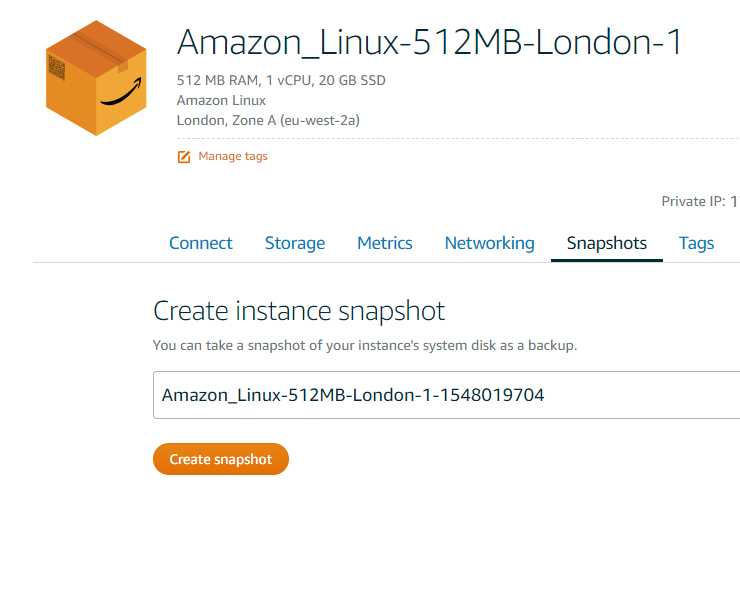 On top of this, you might have a permanent 14 days of backups, each with a 1GB delta (this would be generous for a web server) – adding another $0.70 to total $2.70/month for a rolling 14 days of snapshots. Suddenly things are getting expensive!